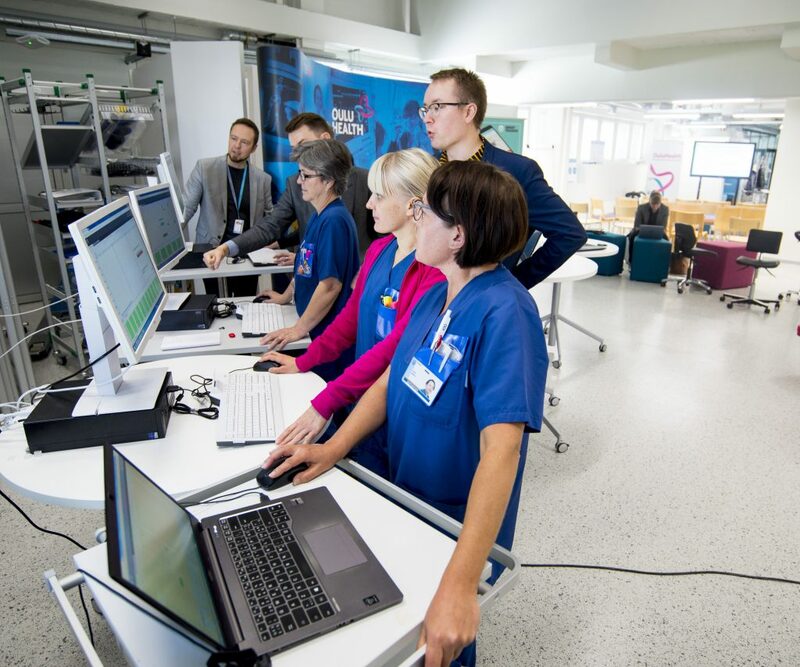 Healthcare professionals from Oulu University Hospital and the digital health company Delfoi during the co-creation process. 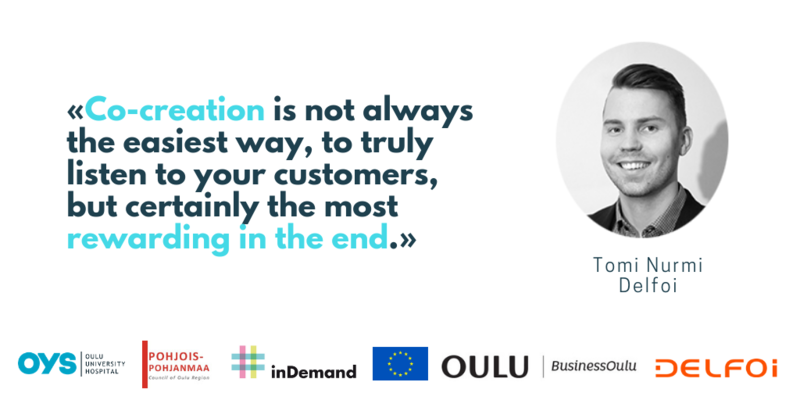 Let’s know better their experience and results of the co-creation process chatting with Tomi Nurmi. Delfoi was founded in 1990 and has operated in Health sector for past 15 years. We have extensive experience with around 300 development projects in healthcare in its various areas. Delfoi’s experience in the logistics and process development projects and surveys carried out in the hospital environment covers all the key functions of the hospital, from hot to support services. In addition, we have done software deliveries for resource planning in healthcare. In addition, Delfoi develops Industry 4.0 solutions such as production planning & scheduling (Delfoi Planner) and robot offline programming and simulation solutions (Delfoi Robotics) and related consulting services for the industry. Delfoi’s solutions enable companies to speed up and streamline their production and delivery processes. Oulu University Hospital needed a solution supporting resource planning for more efficient implementation of rooms. They wanted to have better visibility on their resources. They needed to be able to plan the usage, find resources and reallocate them easily. Our solution proposal was based on an existing cloud-based Delfoi Planner® solution. We realized that the main problem was the lack of transparent resource planning in healthcare. Delfoi Planner healthcare solution enables integrated planning and scheduling for reception times, rooms, doctors, nurses and other staff groups from a secured cloud service (SaaS). Planning is based on the forecasted reception demand, existing rooms and personnel resources and skills. To address an acute need for rooms we offered to develop a new add-on for the existing solution. This add-on was a mobile interface from which it was easy to reserve rooms for a specific need. Co-creation is a natural way to move forward and create innovations which have market potential. Co-creation is in the DNA of Delfoi. We have always worked together with our current and potential customers to co-create our solutions even better. It is not always the easiest way to truly listen to your customer, but certainly the most rewarding in the end. Through successful co-creation, all parties learn from each other and a higher level of understanding can be achieved. When the need for a solution has been presented, challenge it, discuss with the customer and find the root cause of the problem by working together as a team. The reason for not accepting the first idea of the customer as the only solution is that the customer is able to see the problems they face in everyday work, but these problems are usually caused by some deeper problem, the root cause, that has to be digged up by questioning and working together. In addition, the one with problems does not usually have the best insight to the solutions available and it is the job of the solver to present some new ideas of solving the root cause of the problems. This is how the idea will turn into great solution for the problem. After the inDemand project, we are going to test the new feature of Delfoi Planner also with our existing customers. The feature will be included in our existing Delfoi Planner solution. The business support received has helped us to ask the right questions about our new business and answer those questions. This has helped us to improve our business and increase the clarity of where are we heading, and which means we need to get there. Also, we have received some great ideas for new events and contacts. Digital transformation pays off because it allows to transfer, communicate and visualize data more efficiently through automation and other digital tools. This will deliver a productivity leap and gives professionals more time with customers and other value-adding activities. Ultimately, the transformation leads to better service for customers.